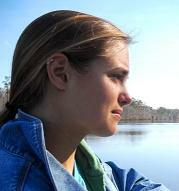 Mobile Bay native Brinkley Hutchings flew over the water and saw the crude oil heading for her home. On May 13th, the 22nd day of the oil gusher in the Gulf of Mexico, Tony Hayward, the CEO of BP, gave an interview and downplayed it.1 “The Gulf of Mexico is a very big ocean. The amount of volume of oil and dispersant we are putting into it is tiny in relation to the total water volume,“ he said. But by the time he had spoken those words, some of that oil had already reached Dauphin Island, where a woman, walking in the ocean, stepped on a tar ball.2 Once, I too walked in the ocean at Dauphin Island, but without the slightest thought of tar balls – or any care at all. But I fear my children will not have the chance to do the same. Hayward said, “Apollo 13 [the failed moon mission] did not stop the space race. Neither did the Air France plane [crash] last year coming out of Brazil stop the world airline industry flying people around the world. 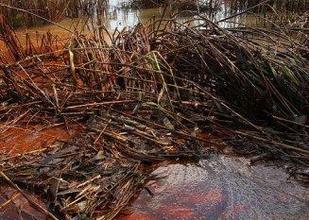 It’s the same for the oil industry.” But unlike those two mishaps, the oil gusher does widespread and ongoing damage. 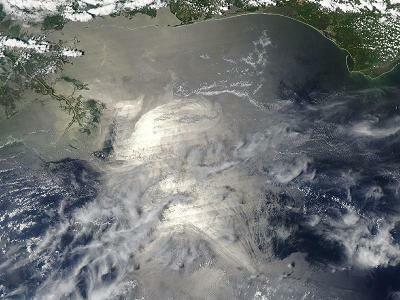 Within a week of Hayward’s comment, heavy oil had drifted into the marshes of the Mississippi Delta, where, as a reporter wrote, “Shiny tar balls were caught in thickets of reeds where crabs swarmed about, their shells painted orange by the crude.”3 A Mobile Bay native viewed the “miles and miles of crude oil” from an airplane, and wept when she saw the oil heading for her home, where as a child, she remembered, “I was packing my lunch and spending the whole day exploring [the waterways] in my little 13 foot boat.”4 Hayward said, “In the last four or five years we have made major improvements in safety performance. … Four years ago it could have been very different.” But we are left to wonder what those safety improvements were and how much better off we are, when one-fifth of the Gulf of Mexico is off-limits to fishing due to oil contamination, and as more and more oil gushes up into the water.5+6 And we are left to ponder how to tame a capitalist system, where a person like Mr. Hayward could take charge of an enterprise so dangerous to wildlife and nature, while having so little regard for them, and for a person’s right to enjoy one’s little nook of the planet.